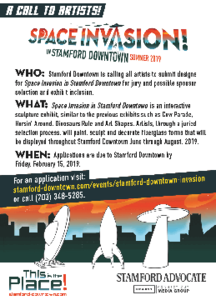 Stamford, CT - The Stamford Downtown Special Services District is calling all artists to submit designs for SPACE INVASION IN STAMFORD DOWNTOWN Art in Public Places for jury and possible sponsor selection and exhibit inclusion. Similar to the Cow Parade, Horsin’ Around, Street Seats, Dinosaurs Rule and Art Shapes, SPACE INVASION IN STAMFORD DOWNTOWN is an interactive sculpture exhibit. Artists, through a juried selection process, will paint, sculpt and decorate three shapes of fiberglass space ships that will be displayed throughout Stamford Downtown June through August, 2019. The exhibit will once again engage the talent of the local and regional art community and captivate the imagination of young and old alike. Applications are due to the Stamford Downtown office by Friday, February 15, 2019.